Sega really is trying to keep the company alive by pure nostalgia these days. Originally when I heard about re releases for the Mega Drive games with the cheap tagline that they are now in 3D, I just wasn’t sold. The price point in my opinion is fair, but I just really didn’t feel the need to play Ecco the Dolphin, Sonic, and yes even the original Streets of Rage in 3D despite enjoying all three of those titles. I am still happy to play all of these games on original hardware or on the Ultimate Mega Drive Collection (Sonic’s Ultimate Genesis Collection in the US) on PS3 or Xbox 360. 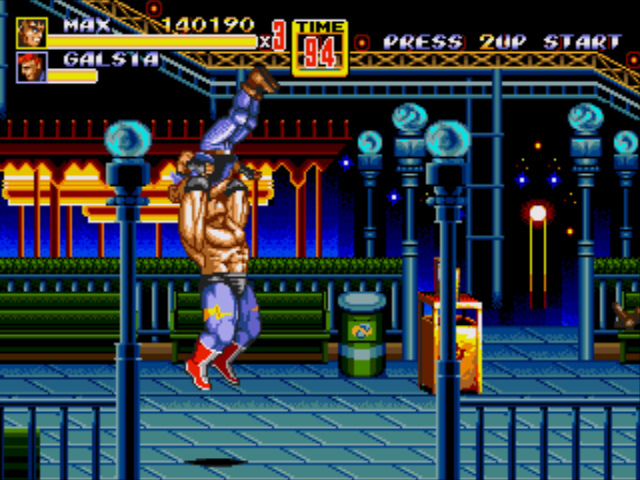 Streets of Rage 2 is different. When I heard the game was being remastered in 3D for the 3DS I started to get a little interested. 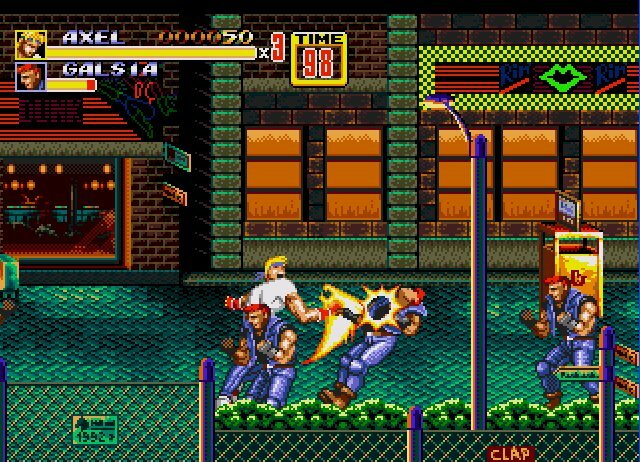 When I was younger Streets of Rage 2 was one of the very few games my brother and I got brand new and we were very lucky to enjoy the experience so close to launch. My brother and I enjoyed the game immensely even if he was always playing as Max and I was forced to play as one of the far more inferior powered characters. It’s a game we played to death, so much so, I’m amazed the cartridge still works. Despite new game consoles coming out it’s a game we constantly revisited. Things have changed a lot now I sadly don’t see my brother a lot as he lives very far away from me. We’re lucky to meet up a couple of times a year and when we do we usually play a bit of the original Halo on Xbox and Streets of Rage 2. So even though it sounds kinda sad and soppy, the main reason I purchased the game was because I was feeling very nostagic and buying the game on launch day from the eShop kinda mentally reminded me of the good times I had with my brother. Collectors thrive on this sort of nostalgia and there really is nothing like replaying that one game you love on multiple systems. Even though I was playing alone I felt like I was right back at that moment, playing the game for the first time. Sure I was playing the game alone as Max of course, who’s abbs that looked badass in the begining, somehow look better in 3D. It’s interesting re visiting a game you’ve literally played what seems hundreds of times. I still chuckle at reading the names of some of the enemies as you watch their health bars gradually drain as you consisitenly punch them in the face. A particular favourite of mine was the punk haired knife throwing biker fella called “Beano.” It makes me laugh because it shares the same name as a British comic I used to read in my youth. 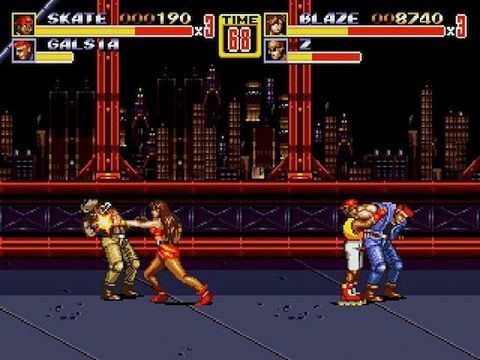 I guess at the end of the day Streets of Rage 2 is one of those games kinda like Rainbow Islands that has that extra special place in my heart, that when I need that kick of nostalgia or something just to remember the good times with my brother, I can head over to that game. I don’t care if I have to re buy it, i’ll be part of the problem and download it again and again. Sega is looking to release some more beloved Mega Drive titles to the 3DS like Gunstar Heroes and Sonic 2 at the reasonable price of £4.49 later in the year, and I have to say I’m tempted. Some may argue the price point is a bit much as you can pick up the titles probably for less on Pc and free if you go the emulation route. It’s still a lot cheaper than a brand new physical game for next gen game, and this one will keep me entertained on my long travels to work.